How it works is the ultimate in informative, yet accessible, scientific light reading. Effortlessly jumping between covering a range of fascinating subjects and answering age-old questions. So, if you've ever wondered how the pyramids were built, how the gravitational pull of the moon affects the ocean tide, or even how an astronaut washes their hair, then How It Works is the magazine you've been looking for. 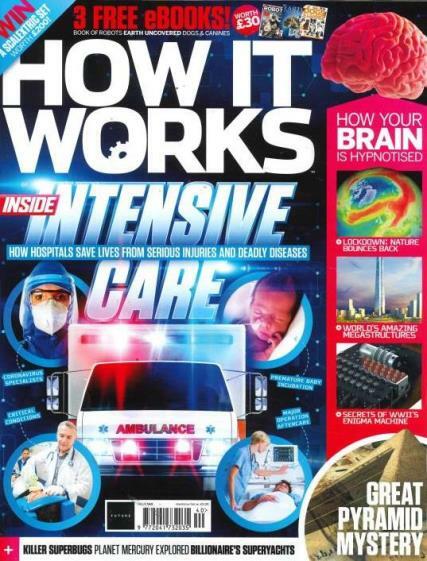 Comprising of around 100 high-quality pages, How It Works contains a breath taking amount of knowledge in each issue. Thanks to an easy to understand writing style however, How It Works is never a difficult read and its lack of jargon makes it accessible to anybody who wants to learn more about the world. With a fantastic mix of bite-sized facts and in-depth investigations into natural and man-made phenomenon, you can be sure that each issue of How It Works will keep you gripped from cover to cover. Terrific magazine that my son and I enjoy. I have subscribed it for my kids. I hope it will show them how interesting our world is and they will find science as a fascinating subject.Brilliant and interesting articles for girls (nature) and boys (machines). Plus surprising facts, astronomy, history and lots more. This was bought for my husband. Although I haven't yet read it, I can see lots of articles that I will read. Looks VERY good.